The buildup was intense. Since July, when Sotheby’s struck a deal with eBay to have its auctions carried live, the marriage of the blue-blood auction house to the blue-collar online retailer had generated tingles of anticipation. But on Wednesday, when eBay streamed Sotheby’s auctions for the first time, the event could not have been more sedate, more like a day at the library than a cut-and-thrust bidding war over Cameoware dishes. 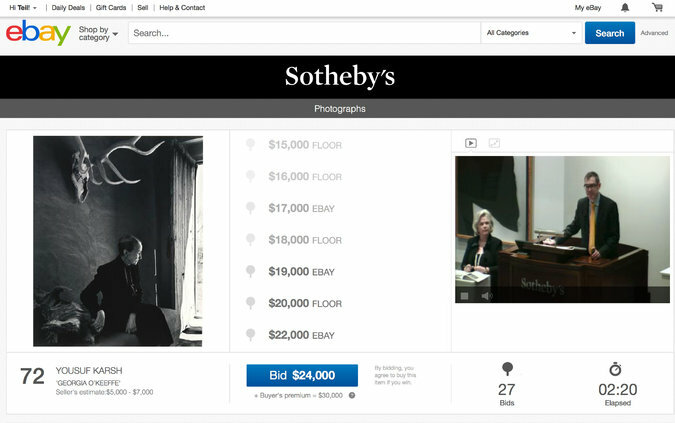 Sotheby’s held two auctions in its York Avenue showrooms, allowing eBay users to place bids online, in real time, along with on-site and telephone bidders and visitors to its own website, which has carried live auctions since 2010. The first auction, which began at 10 a.m. and ran until late afternoon, was devoted to photography, with 188 lots by masters like Eugène Atget, Ansel Adams, Irving Penn, Richard Avedon. Many of the lots were estimated to sell for $5,000 to $30,000, and most attracted some online bids, although it was impossible to tell by watching whether they came from eBay or the Sotheby’s website. The total for the sale came to $5.17 million, according to Sotheby’s. Last year’s photography sale, with 187 lots, earned just over $4 million.